The tooth fairy is visiting tonight! 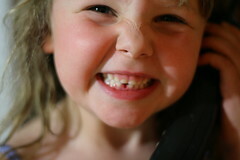 Paige has had a loose tooth for a few weeks now and she's been quite proud of it. 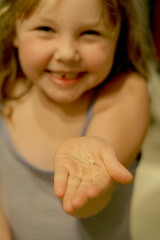 Tonight she hit the latest milestone- First lost tooth! With a lot of coaxing and wiggling and tie it with dental floss, it decided it was better to be out than in. Man did she get excited!! I've never seen her like that before! She wrote a note to go along with her tooth under the pillow, "Please toothfairy, leave my tooth behind along with the money. Love Paige" That's my girl! Tonight, I'm forcing myself to sit down and blog right now. As of late I've been in the strangest frame of mind and I'm not entirely sure what it's all about. I'm most certainly not depressed, but I've been very irritable. Maybe you remember my complaining about the mystery gall stones back in October? Well the scan for gallstones came up clear and the pain subsided just a little while I avoided certain foods etc. Lately the pain has been consistent regardless as to weather I'm eating food or NOT. My doctor and i discussed the possibility of me having IBS all the symptoms match up quite completely and she prescribed a medication called Dicetel. So far I've seen absolutely no difference in the amount of pain, i might even say I've had an increase in the amount of pain I'm feeling. If it were not for the prodigious doses of Advil, I would not be able to function at all. I know that the nagging pains I feel during the day not only exhaust me (like two children underfoot aren't enough??) but make me very irritable towards everyone. It's hard to even sit here at the computer and think out a coherent sentence. You may have noticed the 'quality' of recent posts lacking because of this, and if you haven't noticed anything different... ignore that last bit. It would be nice to know someone who has experience with this condition to compare notes, I've read a lot on the internet about it and it's all rather vague. So far I've been unable to manage the condition, but I have been able to manage the pain with constipating drugs...counter productive but very necessary I'm afraid. Anyone out there with a word of assistance please leave a comment- anything would be much appreciated!! I am staying positive, not wallowing in self pity. I prefer to take a proactive approach to this and get it solved. 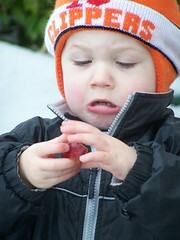 Something wrong with your apple??? Someone please tell me if this happens to anyone else because I find it funny and so terribly annoying. For the last week or so I've been waking myself up, like having the kids wake me up through the night wasn't enough. So, imagine if you will, I'm laying there, drifting off to sleep. Just when it seems I've stepped both feet behind the velvet rope of club dreamland, I see a large pig floating past my hotel room window (this is a dream, humour me) excitedly I shout to Ken to tell him to come and take a look. The problem is that when talk in my dream the dream words actually try to come out of my REAL MOUTH!!! I blurt out some kind of gurgle, squeal or shout and scare the bejeebers out of myself! Is that not nuts?? It's time to visit the doc tomorrow and get some more of the magical sleepy pills she prescribed me. They are amazing, supposedly non addicting but they KEEP you asleep even when you've been woke up you are able to fall back asleep without a problem. Lovely, I tell ya. I don't know what it says about the pills (or me) that I haven't slept well since my script ran out... I guess I've slept but not well, as in, many consecutive hours at a time. Anyway... Do you do anything weird at night?? I've actually got a list of strange night time glitches as long as my arm but that's for another blog post (and it will be a long one!). Please share yours, I don't want to feel alone in this strange, strange world. The time has come. 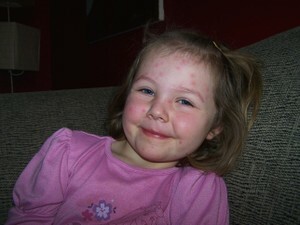 Chicken pox has arrived at the McEachern household by latching onto my poor baby girl! We discovered a couple pink spots on her forhead on Sunday night and by monday morning those pink spots had turned into little blisters. Poor gal, she was so devastated to hear that she had chicken pox she just cried as Ken and I consoled her telling her it was no big deal, and everyone gets the chicken pox. 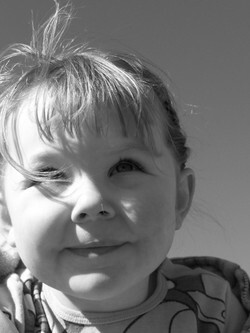 I don't think she really knew what chicken pox were but it didn't sound good to her so she was a little bit shocked. When Elizabeth got home from school she made Paige a 'Get well soon' card which made her feel like having the chicken pox made her 'Special' all of the sudden. It was pretty touching, and the card is so damn cute, and features a lovely pink Elizabeth and a chicken pocked Paige. I'm keeping it forever. Last night before bed, Paige was dismayed at the appearance of Calamine lotion all over her forhead and wanted it off. 90% of her chicken pox are convening on her forhead and I figured the calamine lotion would give her some relief during the night. To show her it wasn't a bid deal I slathered my forhead in calamine, and made her laugh when I slathered it all over the rest of my face. My face started getting terribly itchy as the calamine dried, I thought that stuff was supposed to prevent itching??? Do you think that crap would come off my face?? I went out yesterday and bought a bunch of crafty items to keep her busy over the week since we are out at least 2 days of daycare (big bummer!). So far so good, we made beaded christmas trees... that I have yet to photograph. I was inspired for the craft by another blog, the name of which absolutey escapes me at the moment. Tis the season to sniffle. It's offiicial. I've got my first cold of the season and October hasn't even started yet. I've been feeling the familiar tickle and ooziness in the back of my throat for a few days but yesterday it hit me with both barrels. Both the kids have it too so I think today is going to be a bust, even though Paige is at Daycare. Can someone explain to me how my nose can be so plugged that I can't pass air through my nostrils but watery fluid still seems to drip out??? I went in today for my wonky ankle. Actually i woke up this morning thinking "Wow, it feels pretty good, it must be getting better." Of course I've said this to myself every morning for the last two weeks. Then I try and walk normally down the stairs... And I nearly collapse when I apply my full body weight on my left foot. It feels as though my leg bone is trying to poke through the bottom of my foot. Later on in the morning Paige stepped on the back of my flip flop which made my foot twist funny and the pain was back to square one again. So off to the doc I went. He told me that my ankle was indeed sprained, it rated a 2 on a scale from 1 to 3. He also told me there was nothing I could do to make it feel better except take it easy on it. I left with a referral for some physio therapy and my ever present painful limp. When I got home I looked up my injury a little further (thanks to google) and said that my ankle should be stabilized for a couple weeks to let the injured tendons heal. Repeated injury of the tendons could lead to a chronic condition. Why didn't the doctor mention this??? I have re-rolled the ankle several times since the original injury which only makes sense because now the ankle has been weakened and it can't hold itself in position like it could before. Doctors really tick me off sometimes. Even Suzanne told me to wrap it right away, ya i know, i didn't. I think I'll stick with Suz for my medical care from now on. So tomorrow, I'm going to buy a neoprene ankle brace (thanks for the tip Jes!) a large bottle of ibuprofen. Also, the doctor recommended I start aerobics to strengthen my ankles which ain't going to happen. I flippin' hate aerobics. But I'll find some other techniques, thanks anyway. If all goes well my ankle should be nearly up to original strength in ohhh, about 6 months. Anyway, that's the cranky ankle update... I'm sure you'll be hearing more about it as time rolls on. Last night I took a moment to skip out of the house and pick up a prescription for Paige and one that has been waiting for me at the pharmacy. When I dropped off Paige's script, the tech told me it would be a 40 minute wait (not a surprise at this pharmacy). The time was used wandering through the aisles checking out new products and the Easter stuff. After I had been through most of the store, TWICE, I thought I would go stand at the counter and stare at them to put the pressure on. Perhaps they forgot about me?? I stand at the counter and stare, as planned. The tech felt my eyeballs burning a hole in her forehead and came over. "Can I help you??" She asks. "I'm just waiting for my prescription!" She disappears behind the tall shelving and another thirty minutes passes. Mrs. tech reappears from behind the shelves and informs me that they don't have the medicine prescribed in liquid form. What???? I checked the receipt, the bottle was worth 98$ and My insurance covers 90% of ALL my prescriptions, so something was terribly wrong with those numbers. I told Mrs. Tech lady and she didn't have any answers for me, not that I expected her to at this point. But I was frustrated that I sat around the pharmacy for an hour and a half and wasn't even going to leave with MY prescription. This is not the first time they've pissed me off. I originally picked this pharmacy when I was pregnant and buying a lot of diabetic supplies. They always had everything I needed on hand, they were next door to the hospital so they were familiar with my doctors and strange prescriptions. The main pharmacist is in the midst of opening a new pharmacy (down the street from me!!!) so he has since left and the place has gone to hell in a hand-basket since. I can't wait for the new pharmacy to open, I'm having all my scripts transferred over there. I don't even care if they screw up at the new place, It's down the street from my house, and next door to Tim Horton's- waiting, and screw-ups would be very easily dealt with. I've been wandering around my house lately looking at the state it's in and feeling a tad bit overwhelmed. Over the last several months of sickness I've let the place get really out of hand. I don't even know where to start. I've been watching this show called "Neat" on HGTV (my favourite channel!). Even though my rooms don't necessarily look like the out of control chaos featured on that show- they are out of control. My husband comes from the cleaning school of 'Out of sight, out of mind' where as I come from the school of "a place of everything and everything in it's place" even if that place tends to be a basket above the fridge. Between the both of us, our house is a jumbled mess. Half the time we go out and buy something we already own because we can't find the one we already own. You would never guess from first glance the mess the house is in, the house is relatively 'put together', even though it has it's moments, I do have two children under 5 after all. But it's the ORGANIZATION I need help with. Due to our house being on the smaller side our storage is lacking. I actually have a lot of places to put stuff but I can't figure out the hows and wheres on my own. I need the lady from Neat- Hellen Buttigieg!! I seriously considered hiring someone to come in and give me a full day of organizing help... I'm not kidding. But I haven't found anything in my town yet. What I'm doing in the meantime, while waiting for Helen to return my calls, is pick a spot that is bugging me and once every other day purge that spot and try to organize it as best as I can. Yesterday was our coat rack and front closet. It doesn't necessarily look any better than before I started but I know that it's organized and I would be able to find my shoes and sewing stuff if I had to. That makes me feel good. Next zone is under the bathroom sink. Come on Helen, I'm waiting!!!! p.s. for those of you wondering how Suz is doing- she's great. Her doctor appointments and U/S went great and now she's off to North Dakota on holidays. Have fun!! So I blogged last about my many lovely health problems. That night they got a little worse. My daughter woke up at 2 AM complaining of stomach pain and an hour later it was vomit central around here. I was up for 3 hours comforting her before the pain and hair-trigger heaving would stop and let her sleep. This morning my Hubby was in the same boat, AND he was already sick with some other bug before that. I slept for most of the day- to make up for the lack of sleep the night before. And last night I started to develop sharp shooting pains in my stomach accompanied by loads of nausea and cramping. So far no heaving on my part but the night is young. I've only eaten perogies today and that was at 2 PM the rest of the day it's been water, water, and more water. Water is as easy coming up as it is going down. We went to bed at 9 AM after watching KONG so now I'm wide awake, my body feeling like it's had enough sleeping for one night. p.s. Yes, I missed my first Words of wisdom Wednesday- but I think i was justified. I may feature it on Friday this week. I don't know what's the matter with me today but I've been so tired I nearly have to HOLD my eyes open. Finally deciding enough was enough, I grabbed the kids and went to the gym for a work out. It felt good to finally get back to it. Yesterday I had a nice little 'Mom's Day out'... alone. After having guests with children all weekend it was nice to be out by myself and do a little shopping. I was still rushed because I had to get home (long story), but the little outing was nice. I spoiled myself with two new pairs of shoes. My goal for the shoes was to find a pair that I could slip on without socks and still match most of the clothes I wear. 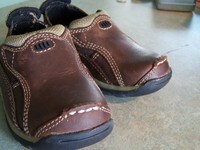 I found one pair of slip on sneaker style shoes... no picture of those yet. But as I strolled around I found these: (see picture to the right). 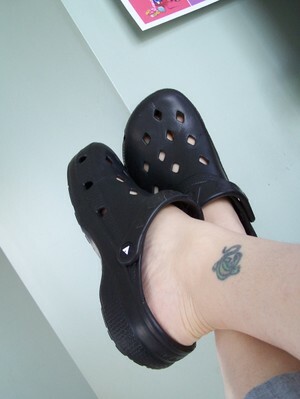 They are imitation Crocs but these ones are made by Airwalk. I decided to buy them after I put them on and walked around a bit. They feel like you are walking on marshmellows, so dang comfortable. They come in all kinds of bright colors but I thought I should go with the safe, stain resistant, black. I may just have to buy another pair, because these things are AWESOME! I never want to take them off. I also purchased a new pair of shoes for Nolan because the child only has one pair of shoes that we can never seem to find. Are these NOT the most cute little clod hoppers you've ever seen???? I saw them while shopping with Suz a while ago and couldn't stop thinking about them. They are a size too big but I figure he'll be fitting them by the time he's ready to actually walk in them. I could just sprinkle them with sugar and eat them whole. Anyway, I will be going now- Nolan is more than ready for bed. Talking about shoes seems to have perked me up a little bit, perhaps I should do it more often!